If you’re like me, your journey to a state of trade-readiness – being able to risk real dollars in a real trading account with confidence – proved to be a learning curve and a half. Tons of different ideas, concepts, theories, and tools, any one of which can be arduous to learn, all of which put together can be downright confusing at times. In my early years as an aspiring trader I managed to make every single mistake imaginable (some of which I’d be downright embarrassed by today!) – trying to figure out how to put it all together. The turning point for me was when I realized that price action has a kind of DNA – or ‘blueprint’, – a form and structure that repeats itself across all timeframes from high to low encompassing trend, structure and even indicator readings. The erroneous observation of ‘conflicting signals’ I struggled with early on evaporated like a cloud. Learning to recognize the patterns within the aggregate picture of price action, which alerted me when to take action (or not) was the skill which progressed my trading style from something best described as ‘struggling scalper’ to ‘capable professional’. And the one which helped me overcome the occasional feeling of dread when one chart supposedly told me to think bullish, while another told me the exact opposite (or so I thought). You may be happy with whatever trading style you’ve cobbled together for yourself, making 20 or 50 pips here or there. But have you ever wondered whether there’s an analytical approach that really helps you see what’s going on more clearly across multiple timeframes, in a way that can help you qualify the character of a setup and target not just some arbitrary scalping target but much more of what the market is leaving on the table? 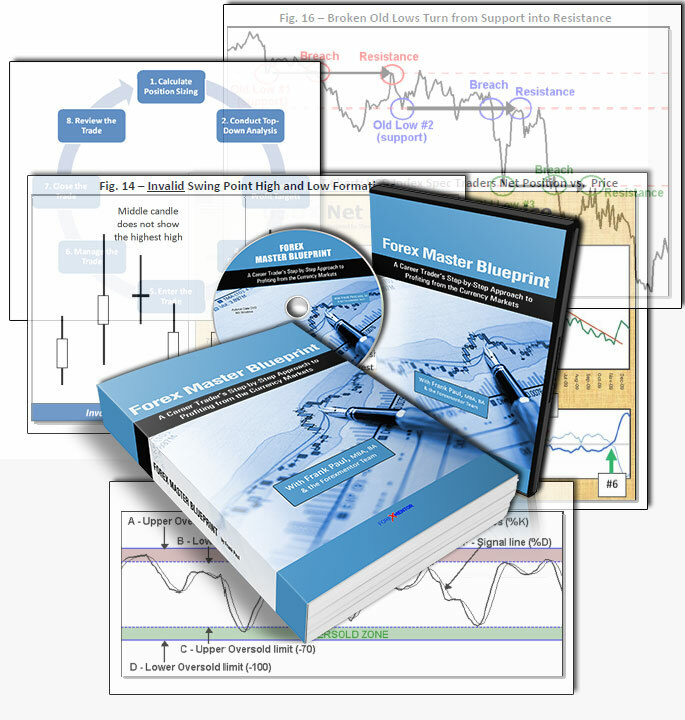 If so, you might be interested in our brand new, multimedia training program called: Forex Master Blueprint, available exclusively at Forexmentor. Regardless of your level of experience in the markets – from ‘newbie’ to advanced – you will find a wealth of trading ideas in this comprehensive resource that will literally catapult your own trading approach to the next level. My name is Frank Paul, creator of Forex Master Blueprint. I’ve been a learning facilitator at Forexmentor since 2007 having authored several other resources during that time, including Fast Track to Forex, Forex Profits with MACD and Forex Profits with COT, all of which have been extremely well received by many hundreds of aspiring traders like yourself. Perhaps more importantly, I’m a career trader, and to earn and keep that particular job title – for both myself and my family – I have to maximize profit and minimize risks intelligently. Every single time I sit down to trade. * Manage risks in a manner that makes you money – even with a low win rate! * Unleash the power of the most effective price pattern in existence – Swing Points!